After much debate and several conversations, my fiance and I decided to create a wedding registry of items we need or that we’d like to update. It seems a bit off from what I’ve been working towards lately, so I thought I’d write up a post that explains (or maybe tries to justify?) our decision. So why did we do it? The main thing that frustrates me about wedding planning has been that the word “tradition” gets thrown around a lot, and often carries with it a hefty weight of guilt. It’s tradition to have a registry. It’s a tradition to not include that info on the invitation – people just have to ask. It’s a lame excuse, yes, but it’s also better than having people confused about our choice, calling us out of frustration and asking, “well what do you want? Just cash? Do you just want money from us?” This way, our more traditional guests get what they want, and through a carefully curated list, we get what we want, too. I’m looking forward to getting a lot of handmade gifts, especially since my friends and family are a creative and generous bunch. But, what I was worried about without a registry was getting strange trinkets that my husband-to-be and I really don’t need. Having specific requests takes the guesswork out of what we really want, need or even like. Most of our cookware, utensils and place settings are mismatched Goodwill finds – and not in the quirky, cute way. We picked them up throughout college, finding them in dark corners of new apartments when we moved, picking them up for under a dollar at garage sales…you get the picture. Having a registry is a good opportunity to upgrade our kitchen appliances, our linens and our tableware so that we have uniform, high-quality essentials that will last us forever. As a friend reminded me, one of my central tenets as I go through minimizing is keeping what is useful and beautiful, but with a high focus on quality so I don’t have to ever purchase the item again. Since I didn’t want to get too tempted by exploring beautiful stores like Crate & Barrel, I decided not to do an in-store registry. I’ve been having fun, snooping around Amazon for great deals and quality items. While I’m not sure how the convenience of it will work out for our guests, I feel good about being able to check prices and reviews before adding anything to the registry without a salesperson telling me what I need and what I don’t. For example, I’ve heard friends talk about how the salesperson told them that it was traditional to register for 12, but they thought it was too much and registered for 10 instead. My fiance and I are doing fine with 4, and we’re not planning on hosting massive formal dinner parties any time soon. Those, however, will be replaced soon by 6 settings of the much thinner and lighter Corelle dishes so we can maximize our space in our cupboards wherever we move next. So, what did we register for? Tea and soap – who says consumables can’t make the list? A tent. I don’t know, if we ever get a weekend off at the same time, maybe we’ll go on adventures! Glass spray bottles for our homemade cleaning supplies! Baskets – it’s time to get rid of the cracked, dollar-store plastic baskets that we’ve been keeping produce and toiletries in and get some baskets that won’t break. I requested metal for the kitchen, wicker for the bedroom and bath. 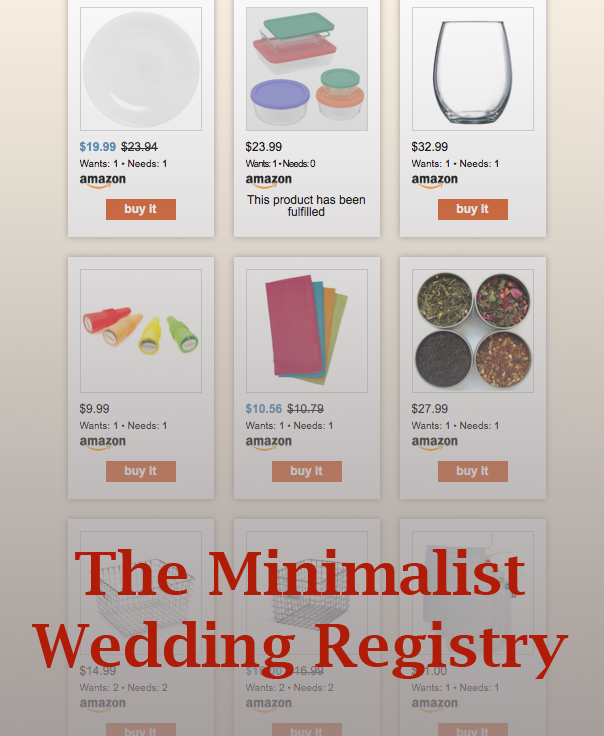 What do you think about the strange conflict between minimalism and wedding registries? Or, minimalism and weddings in general? Is there anything I left off, or anything you wouldn’t add to the list? It really varies from person to person, so I’d love to hear your thoughts in the comments below. This entry was posted in Minimalism and tagged clutter, minimalism, simplify, wedding, Wedding planning. Bookmark the permalink. This is brilliant! We were definitely still chasing the american dream of a big house full of stuff when we got married. We even registered for a lawn mower because we thought we would buy a house! And four years later we’re in a condo. One thing you also can do is put charities on the list. About half of our guests donated to the four charities we selected. It definitely helped reduce the amount of stuff we got. Registering for charities is a great idea – I’ve toyed around with the idea of also donating a small amount in honor of each guest as a wedding favor! I think I was fairly reasonable it picking upgrade items for our registry that we would actually use (a hose, small sauce pan,etc) along with items I would love to use to expand my recipe and cooking experience (read: kitchenaid stand mixer), without letting tradition obligate me to add things we already had like towels and bedding. However, after the honeymoon and unpacking all the gifts I felt a huge amount of guilt over the amount of stuff the wedding brought into our home. This led me to minimalism blogs and a pretty intense reduction of clutter. I’m also not feeling guilty about letting go of any gifts that dont turn out to be as useful as they seemed at the time. This has been a blessing since we just discovered we have to pack up everything and move out of state for a new job!! “I’m also not feeling guilty about letting go of any gifts that dont turn out to be as useful as they seemed at the time.” <- that's going to be important as my future husband and I move forward! Thank you for sharing your experience, I'm so glad to hear about others' solutions and insights about things I struggle with 🙂 Congrats and best wishes on the move! After having been married for seven years I’ve now gotten rid of many of the things we received for our wedding. However, I didn’t live on my own before we married so I needed time to learn about what I really wanted. I picked out things that were pretty but ended up realizing they were not as well made as the things that I could get for a better price. If you don’t already know you’re going to use the tent, I’d probably take that off the list. You can always get one later. Congratulations on your upcoming marriage! I wanted pretty things, but I’m pretty rough on things like plates and glasses, so I removed them quickly after I added them. I’d rather have quality, too! My beloved and I are making wedding plans (engaged but no date set yet) and we are planning on doing a charity registry with the Seva Foundation. We both agree that we have too much stuff already, and a donation for a surgery to allow a blind person in Nepal to see again is a better celebration of our lives together than towels or a serving platter. I know we will have a few people who will insist on giving us physical things but we have discussed returning those for cash and donating that ourselves. We really need nothing in regards to material things, but it has been my experience that some people really want to hand over a box at a gift-giving occasion…. That said, the EarthBox is pretty cool. I really like ours. I suggest taking the tent off the list. Borrow a tent from a friend if you go camping. We lend ours out all the time, and we borrow the camp table and lantern from neighbors when we camp. It is just one more thing you have to store 51 weeks of the year. Hey Debbie! I’m so sorry for the ridiculously late response (I went off and got married! It’s a wonderful, busy time). That sounds amazing. Great idea on the tent! We didn’t end up with the EarthBox, but I’ll be hoping to get one once we move to our next place (hopefully somewhere a bit sunnier!) We’re now in the “get rid of all the stuff” mode again, and it’s nice to purge as a couple – what do we really need? Why do we still have some of the things that we still have? Thanks for sharing, and congrats on the upcoming wedding! I’m loving your blog Emily. I know it’s been a bit since you were married, but my husband and I recently got married in February and ran into the same issues with a wedding registry. We are minimalist, and adults with jobs, we felt we had everything we needed and have been tremendously blessed that way. We met a tonne of resistance when it came to gift options from our wedding (from friends, family, and each other). My husband wanted to request donations be made to charities that were close to peoples’ hearts. This was our ultimate solution. There were many people that resisted this however, because people want to give you gifts for your wedding, it’s an expression of love and goodwill as you go into your future together. Because of this (and like you said, if we were receiving gifts we wanted them to be things we actually needed) we made a small registry online, as you did. This is such a relatable post, right down to the love of Corelle because it’s so durable, and takes so little space… due to over zealous gift givers we ended up receiving 16 place settings however 😛 but you do what you can. We loved reading cards about places that received donations in honour of our marriage, and felt like this was a beautiful solution for a minimalist wedding. We also received some gifts we needed, some that were well meaning but way off the mark for us, and some people gifted us money to do what we wanted with. All in all, we were very happy. Jennifer – I’m so glad this resonated with you! We definitely ended up getting things we didn’t register for, but not too much above and beyond. I really enjoyed reading all the “must haves” from different retail stores about what you need on your registry (especially when it comes to place settings and fine dishware….if I had chosen something other than Corelle, I would have broken half of it by now). We ended up not going with a charity, but I love the sentiment of that. I’m thinking of asking for that moving forward when it comes to birthdays and Christmastime, because honestly even after getting rid of all this stuff, I still feel like I have more than I could ever need.